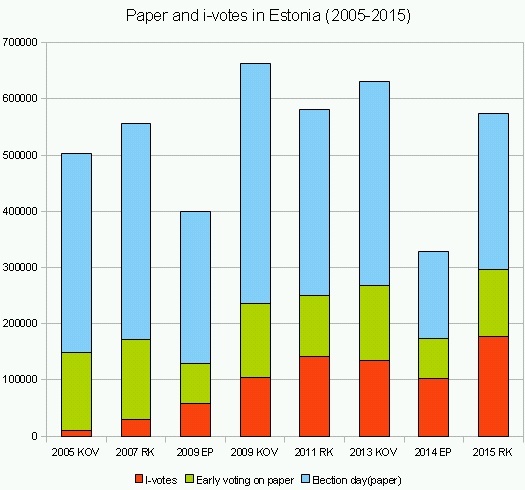 Estonia is still voting on paper. Most votes cast on election day on paper (blue). 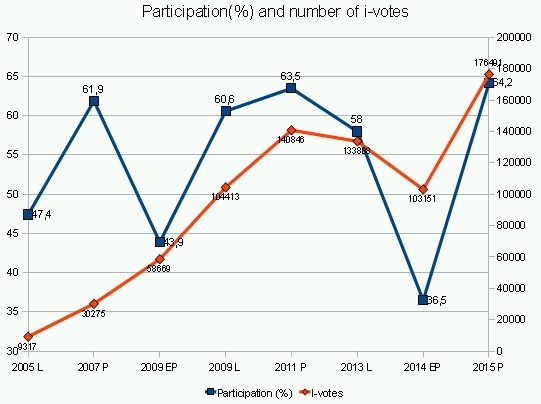 Share of i-votes(red) has risen but participation has stayed the same. Early voting has risen but i-votes are given 2 times less than on paper(per hour). I-voting is only possible during early voting(7 days, 153 hours). Last i-vote is counted and if there is cast paper vote(during early voting period), it will be canceled. On voting day e-voting is not possible. Local election – during 2 last election i-votes have increased up to 133808 but participation fell 4,3%(change 2,6 points) from 60,6 to 58. Parliamentary elections. There is no link between i-voting and participation. European Parliament elections. Number of i-votes almost doubled but participation fell 16,8%(7,4 points) from 43,9% to 36,5%. kust on võimalik selles analüüsis kasutatud andmekogu saada?